← Body Lotions – Who, What, Where, Why? 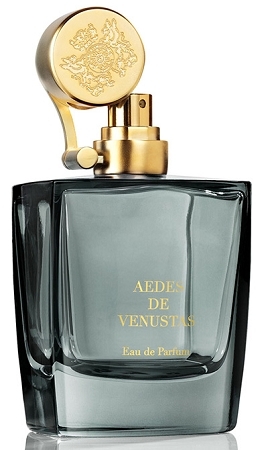 Iris Nazarena was the second fragrance (there are now five) from the eclectic New York boutique, Aedes de Venustas. It features iris, ambrette, juniper berry, star anise, leather, oud, clove, rose, incense, woods, musk and vetiver. The stylish, smoky glass bottle is a very fitting flacon for the fragrance. 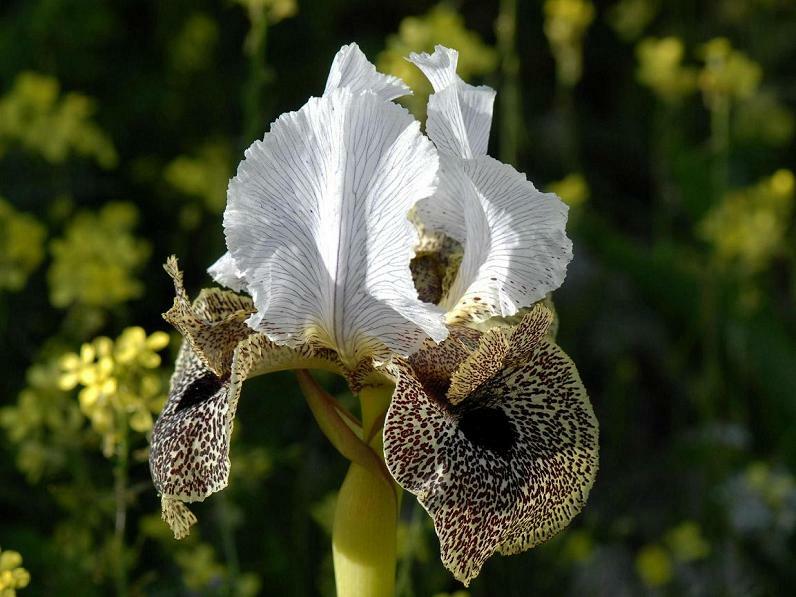 The inspiration for Iris Nazarena is the rare plant species Iris Bismarckiana or “Nazareth Iris”, which is mostly found in the mountains of Israel. Its arresting cream and brown petals are so very different to the purple-ish flowers we’re used to. The fragrance is an equally vivid contrast to the more usual pale and feminine iris perfumes. Iris Nazerena gets off to a great start with lots of cool, rooty iris. But all too soon, it’s overtaken by dry spice (star anise and clove) and thin cedar. The result is that it becomes faintly medicinal. There are also touches of oud and plasticky leather. I get the impression of incense rather than the smoky, burning resin. Some sweetness comes through in the heart which takes me by surprise. Set against the darkness, it’s a beguiling twist and the phase I find the most enjoyable, aside from the opening. Eventually it gets swallowed up by chilly patchouli and vetiver in the base. It may sound like a dense composition; however it’s rather ethereal and transparent. Its character is intellectual, unattainable and a touch mystical. The texture of Iris Nazarena is almost powdered but not quite – more like brushed suede. It stays close to the body and lasts extremely well. Its dry, spiced wood background makes it a slightly more masculine take on iris. It isn’t quite to my taste (mainly because I have difficulty with prominent star anise and clove) but I appreciate its individuality. It’s good to come across iris in such a novel setting. Perfumer Ralf Schwieger seems to have a knack for interpreting familiar materials in an innovative way. Take for example, the witty cosmetic scent of Lipstick Rose or the aromatic yet sensual Fils de Dieu. Schwieger said he wanted to create a modern iris fragrance that broke away from what he considers to be the reference iris, Chanel No.19. He certainly succeeded with Iris Nazarena. It’s very distinctive and different to any other iris fragrance I can think of. 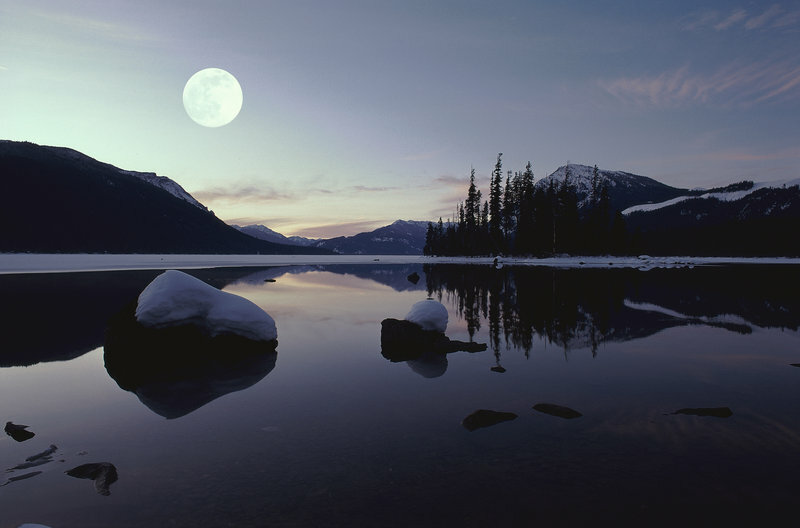 Iris Nazarena is the hazy light of the moon shining onto a placid, silvery lake. The effect is grey yet luminous with a unique hushed and striking quality. Have you tried any fragrances by Aedes de Venustas? This entry was posted in By Tara, Fragrance Reviews, Iris and tagged Aedes de Venustas, floral, Fragrance, Iris, Perfume, Review. Bookmark the permalink. Ines, I can imagine you rocking Iris Nazarena really well. I think it’s interesting that there is an incense theme running through the AdV fragrances. I like the first eponymous one with its rhubarb note which as a slightly more feminine edge than the more unisex In the pursuit of. .by Diane Pernet. I do love their Iris too for a cold crisp late winter morning..it’s the ethereal quality. I think Iris Nazarena would be absolutely perfect on a cold, crisp morning. Lovely review Tara. I have not tried any of the Aedes line. They all sound good and I must admit I like the look of the bottle. They are really classy and well done, plus I agree the bottles are fabulous. Hope they get to Vienna at some point. Beautiful pictures you paint here, especially for a perfume which didn’t quite capture your heart. For me the ‘thin cedar’ was a complete deal breaker, and on my skin I get the feeling it overpowers everything. I would really like to test the new pallisander one though, and I certainly find the line very interesting. Ditto on the cedar Asali but I did find it an intriguing composition that will no doubt shine on others. I must look out for the Pallisander, they have the line at Liberty. One day I’m going to splurge on a bottle of this beauty. That’s great, Portia. A gorgeous bottle it is too. Oh how lovely! What a great gift. The travel atomiser is really striking too. Oops – sorry it is Sable Fumé I’m referring to. Sable Or is Iris / vanilla. Ooh, Tina, that Armani sounds intriguing but I know how some of their exclusives are eye-wateringly expensive. I’m lucky Hiris is so reasonable. Ha – I’m working on an iris post too..:). I didn’t quite take to this one but your review makes me want to resniff it (which probably won’t be for a while since I sent off my sample a while ago to somebody else). Iris is not my favorite note but I think I may have finally found ‘my iris’. Ooh, I’ll be excited to read about your iris when you’ve finished your post, Lavanya. Iris Nazarena wasn’t for me but I really admire it for being such a novel, atmospheric take on the material.